We serve Tri-Cities, Washington, comprising Kennewick, Pasco, Richland and the surrounding communities of West Richland, Benton City, Prosser, Othello, Connell and Hermiston, Oregon. We are located in the southeast corner of Washington State (map) at the confluence of the Columbia, Snake, and Yakima Rivers. 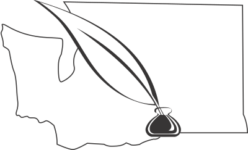 The Tri-City Genealogical Society was founded in 1961 as an organization whose purpose is to educate members and the public on the purposes and methods of genealogical research, and to research, record, and report materials of genealogical value for the people of, and those researching in and around, the Lower Columbia Basin region of eastern Washington state. Our Society is non-sectarian and visitors are always welcome at our functions. Our extensive collection of research materials (books, periodicals and CDs) are located at 1314 Jadwin Ave., Richland (509 946-6637). See TCGS Library to learn what we have to offer, check hours, etc. These goals are accomplished through regular publications, numerous educational programs, and specific research activities that focus on genealogy of the Lower Columbia Basin region. the beautiful Columia River .